David Ives' is best known for his scintillating Venus in Fur, thought-provoking New Jerusalem and comic gems All In The Timing. 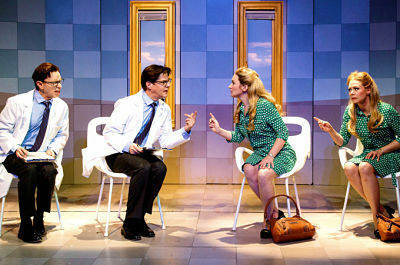 But Lives of the Saints revived off-Broadway at The Duke, is a disappointment. Like Timing, it is a series of one-acts. But the anticipated comedy falls flat and the various subjects, be it friendship, family, nostalgia or odd relationships, never deliver the acclaimed Ives' wit. It's as if this 1999 effort was a first draft he forgot to revise. That's no fault of the talented cast -- Rick Holmes, Arnie Burton, Carson Elrod, Kelly Hutchinson and Liv Rooth -- who play a variety of roles. They do their best, as does director John Rando, with material that feels, with a few notable exceptions, forced. For example, "Soap Opera" features Elrod as a repairman in love with his washing machine. All the expected word play and absurd moments are in place, but it doesn't click. Nor does "The Goodness of Your Heart," which makes an interesting comment about the nature of friendship, as two friends argue over a costly TV. "Life Signs" offers the funniest moments, as a dead mother updates her son on her life experiences, much to his consternation. Two exceptions are the least funny, but the most touching. "It's All Good" posits a man wondering what his life would have been like had he taken a different path. And in a rare moment of fate, he meets his doppelganger. "Lives of the Saints" highlights the ordinary world of two widows who prepare the church lunch following a funeral. Their emotional bond and reflections on a changing world is a high point. The production itself is stylish, and the theater ideal for an intimate work. But no playwright, however fantastic, can hit the mark every time. Ives' cast gives it their all, but Saints remains earthbound. So does Elizabeth Swados' The Nomad, though the lead character's desire, the real-life Isabelle Eberhardt, is to soar. Eberhardt (an energetic Teri Madonna) was an adventurous soul who left Switzerland for exotic Algerian Sahara at the turn of the 20th century. Elizabeth Swados, best known for her Broadway hit Runaways, has turned her remarkable story into a musical, with book and lyrics co-written with Erin Courtney. Now at The Flea, the small theater is suited to the tale of a protean feminist who repudiated Europe, converted to Islam, and led the life of a nomad in colonial Algiers. Dressing as a man and assuming a male identity, Eberhardt called herself Si Mahmoud Essadi. Transgressive and defiant, she challenged social expectations: taking drugs and entered into sexual relationships with abandon. Her provocative behavior caused controversy on both sides of the cultural divide. Yet the wonder of Eberhardt, who traveled with the secret Sufi brotherhood Qadriya, was her versatility. Fluent in Arabic, she spoke out against the harshness of colonial rule, yet managed to remain somewhat friendly with French officers. Swados' score is lovely, and her harmonies capture the distinctions of the region's musical elements. So does her seamless direction, which borrows elements of War Horse to suggest the desert world of soldiers and Muslim rebels in French West Africa. While the ensemble is spot-on, the lyrics are journeyman-like: focused more on narration and less on the interior world of its lead. Still, there are poetic elements in the show, and the 70-minute musical is nicely paced. Eberhardt's story seems larger than life; then again, truth is often stranger than fiction. The Light Princess at the New Victory Theater, is a fiction that charms. A royal couple asks a vindictive witch for a baby. Their wish is granted with a caveat: The baby won't feel much emotion, and she will defy gravity until her 16th birthday. If she can't attain it by then, it's permanent. Turns out, only true love will, literally, ground her. But her prince, who prefers song writing to royal duties, gets a few surprises of his own. The Light Princess is an offbeat, comic fairy tale, thanks to Kristin Wetherington as the witch and Ashley J. Monet as the princess possessed of a lovely voice. Mike Pettry's score works, as does Arthur Oliver's artistic costumes and Julia Noulin-Merat's set design. Puppets by Kathleen Doyle is a pre-show audience winner. Allegra Libonati directs with a flair for the imaginative rather than the technical.